Home NEWS Expert says Kenya has best climate change policies yet its people die of hunger. Expert says Kenya has best climate change policies yet its people die of hunger. Executive Director of the Pan African Climate Justice Alliance (PACJA) Mr. Mithika Mwendwa addressing the media during Africa Climate Week that took place at Accra International Conference Centre in Accra / Ghana. Kenya as a country has been named as one that has the best policy on climate change which are not implemented, hence its people continue to die of starvation, a case study in Turkana County. 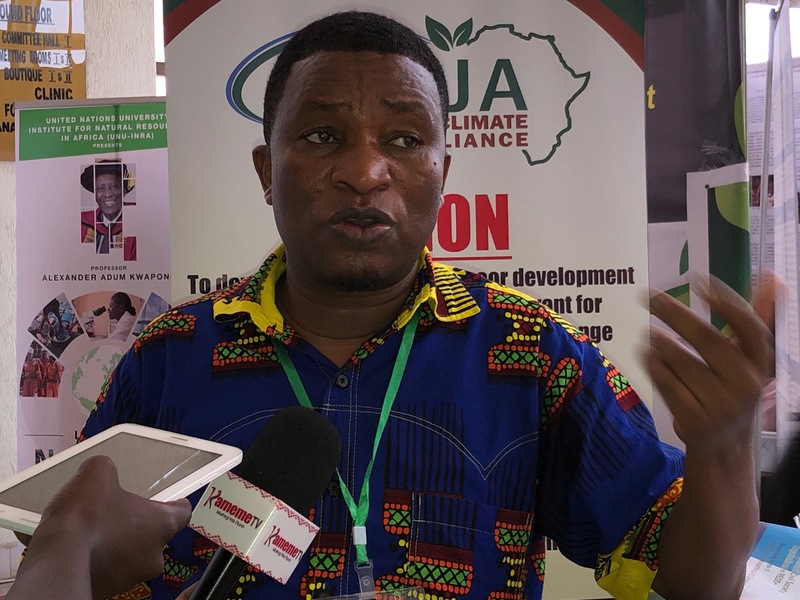 Speaking at the Africa Climate Week Conference held in Accra – Ghana, Executive Director of the Pan African Climate Justice Alliance (PACJA) Mr. Mithika Mwendwa said its saddening for Africa in general to having not realized the effects of climate change at this level. Mwendwa who was named among the “World’s 100 most influential people in Climate Change Policy 2019” on Wednesday, said the starvation that is facing Turkana County residents could have been easily eluded at if only the government implemented the climate change policy, Act 2016. He sais that African continent accounts for very minimal emissions in the atmosphere that are most impacted. He called for the industrial countries who release a lot of emissions to the air to do the most at their domestic levels. Mithika contradicts the conference’s declaration of creating carbon zincs in Africa will not help if the countries will not own up the problem, which he said was agreed even at the Qiotal protocol and the Paris agreement. He said that the carbon market collapsed long time ago due to this emission and so it must be produced in massive sales for all the communities to benefit. Mithika regrets that the best climate change policy in Kenya has been lauded by all African countries yet no action has been done to help Kenyans in terms of climate change. He reveals that Kenya has been getting a lot of money in climate finance but the money has never been accounted for, an issue that has not being going well between governments and civil societies. On his being name being global recognition, Mithika terms it as a phenomenon recognition and gives thanks to all stakeholders. Africa lagging behind in financing on climate change matters. On his part, ECOWAS Centre for Renewable Energy and Energy Efficiency (ECREE) Executive Director Mr. Mahama Kappiar, said it has been hard for most African countries to implement their policy despite having formulated it. He however calls for Africa to invest much on promotion of renewable energy and energy efficiency projects which are pet subjects for World Bank and other international banks that are willing to fund Africa for. Kappiah noted that over 1.3 billion people in the world are yet to get connected to affordable and efficient power where 700 million come from Africa continent. He encouraged Africa to focus on renewable energy for the 700 million people remaining to be connected with electricity, adding that 80 percent of Africans rely on traditional cooking methods that are hazardous to both health and environment. Africans funded by world bank and has mobilized 4000 mini grids in terms of hydro power to get to Africans. He cautions Africa against using the traditional methods of cooking saying that the rate of harvesting forests is far ahead of regeneration process, leading to deforestation. He terms financing of African projects as the main challenge.